Well, a few years back, anyway. For a few years the MIscrappers (Michigan Scrappers) was an active, vibrant email forum of scrappers who met once a month or so to scrap the night away. Our "home" was The Sticker Store and More, a scrapbook store local to me. From that group of paper scrappers there have been several businesses started...ones that have done very well in the scrapping business world. Members have scattered all the way down to New Orleans. Some have kept in touch and the threads among scattered members are strong and might actually bring together the whole group if that were ever possible again. This weekend a few gathered together to make Christmas cards. The little group does this every year, recently in the studio-store of one of the group. Old friends filter in and out. Since one of the group is my sister-in-law, there have been ties that were never severed. This group actually camped together for several years with their families and being with even these few was wonderful. I packed for days! 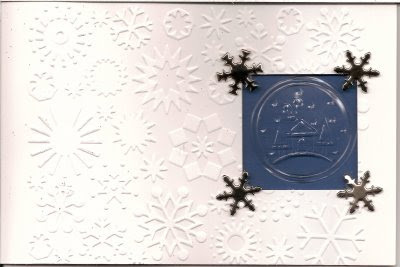 I had kept all of my Christmas stamps punches, papers, embossing powders, ribbons, etc. in a portable stamp station. Most of the rest of my supplies went to various scrapping relatives when I embraced digital. I just couldn't get rid of my best pieces of equipment so that was packed up, too. Muttering to myself about remembering why I went digital, I headed an hour away to my brother and sister-in-law's house on Friday, and to the "card party" early Saturday morning. Each of us was to find a card design, make a sample, and bring everything to teach the others to make the card. The variety ranged from cute to gorgeous. Each was unique and, as someone mentioned, we learned something new with each design. Then as we worked on the cards we had intended to make, we, again, learned from each other, and learned how to use new equipment. I discovered there are some REALLY cool tools since I walked away from paper. Anyway, here are some of the cards I made. 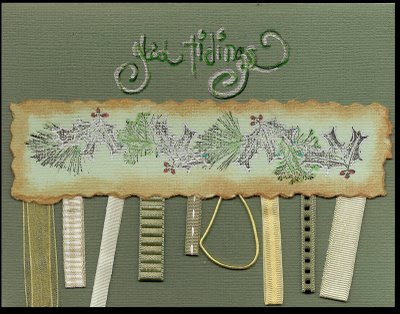 This was the card from which I made kits to share. It was the HouseMouse card for November. Thanks to 2 pennies fastened to the backside of the little mouse, he rolls up and down the hill. This was the card I intended to finish as our main card going out this year. With all those little ribbons it was a bit labor intensive, but I got about a dozen done. 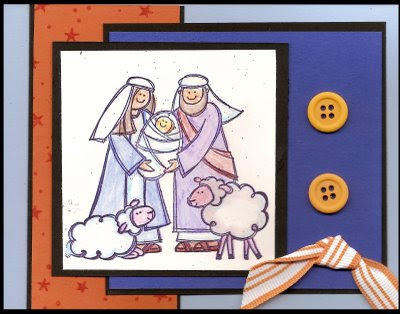 Without this Card Party they would have stayed in my Stamp Station for many more years. This was Deb's design. 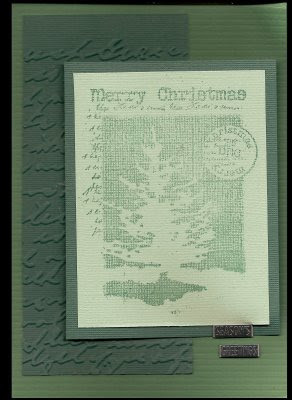 We stamped a long holly image on white paper, and embossed it with green glitter embossing powder. Then we cut that into 3 equal squares, mounted it on a red strip and put that on a card. Next we lightly stamped a pre-punched oval with a swirl stamp and stamped the greeting over that. Finally we added the touch of bling in the decorative staple with a Fastenator. This was designed by Jeanne with a Cri-Cut embosser embossing the paper and the acrylic piece in the window. The snowflakes are brads. This design was a stamped image, torn and chalked on the edges, placed over a strip of Mulberry paper. A decorative staple was added with a Fastenator. This was Sue's design. It is 3 pieces of paper, each matted with a black slightly larger. The top piece was stamped and colored with watercolor pencils. The buttons and ribbon were added to finish it. 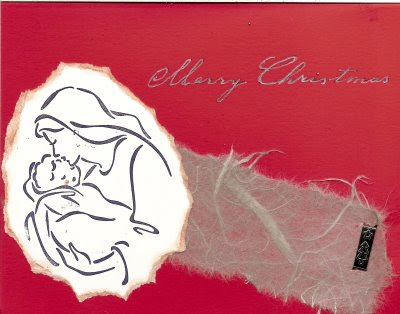 This was Chris' design, using a decorative Christmas paper to fit the card blank. 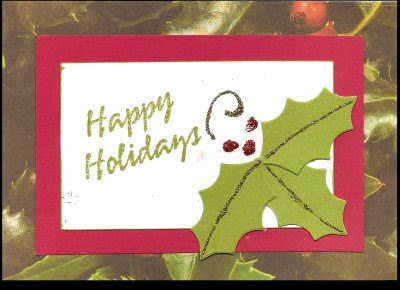 The greeting was stamped and the holly leaves added. 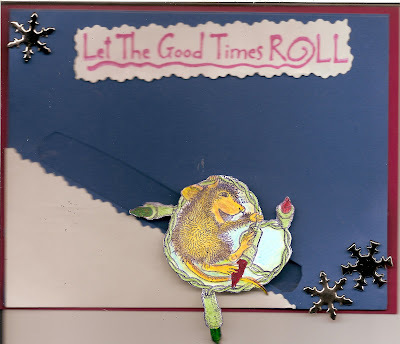 Stickles glitter was added in gold and red berries. This was one Chris designed for her main card this year. Done on a production-line it worked so well the rest of us lifted the design. There are definite styles in scrapbooking. A few months ago I was quite taken with the "Free-form Style" in Digital Scrapbooking Magazine, in the article by Renee Pearson. Here are 2 of my attempts at that style. Click on the title under the picture to go to the gallery and the full version. Last month in the Digital Scrapbooking Artisan Guild Notebook they explored Fantasy Style and I jumped in to that one. Lots of fun for a grandmother. I remember attaching little wings to cutouts from photos when I paper scrapped. Here are a couple of those styles. This month in the Digital Scrapbook Artisan Guild Notebook the style was "Composite Style" Again I had to stretch a bit but that is what makes this craft of ours so much fun. Finally, here is one with a bunch of blending styles that evolved from several of these styles.